61 Commonwealth is located on the north side of Commonwealth, between Berkeley and Clarendon, with 59 Commonwealth to the east and 63 Commonwealth to the west. 61 Commonwealth was designed by architect Carl Fehmer and built in 1879 by H. & H. M. Harmon, builders, for Sarah Elizabeth (Appleton) Lawrence, wife of textile manufacturer and merchant Amos Adams Lawrence. She is shown as the owner on the original building permit application, dated March 15, 1879. Amos and Sarah Lawrence’s son and daughter-in-law, Amory Appleton Lawrence and Emily Fairfax (Silsbee) Lawrence, lived next door, at 59 Commonwealth, which they had built ca. 1874. Sarah Lawrence purchased the land for 61 Commonwealth on February 5, 1877, from Francis Thompson. He had acquired it on June 25, 1872, from Robert Codman and Henry A. Johnson, who had purchased it from the Commonwealth of Massachusetts on May 29, 1865. Click here for an index to the deeds for 61 Commonwealth. 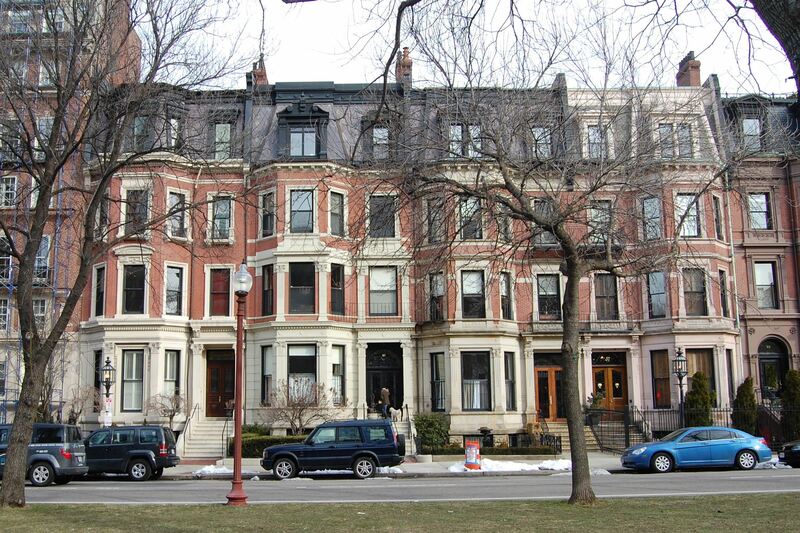 Amos and and Sarah Lawrence lived in the Longwood district of Brookline and never occupied 61 Commonwealth. They leased the house to others. By the 1880-1881 winter season, 61 Commonwealth was the home of fertilizer manufacturer William Lambert Bradley and his wife, Frances Martina (Coe) Bradley. They previously had lived at 28 Chester Park. Their son, Robert Stow Bradley, lived with them. He was treasurer of his father’s fertilizer business. Robert Bradley married in December of 1881 to Leslie Newell. They lived at 61 Commonwealth after their marriage. In about 1883, William and Frances Bradley moved to a new home they had built at 179 Commonwealth, and Robert and Leslie Bradley moved to 349 Marlborough. 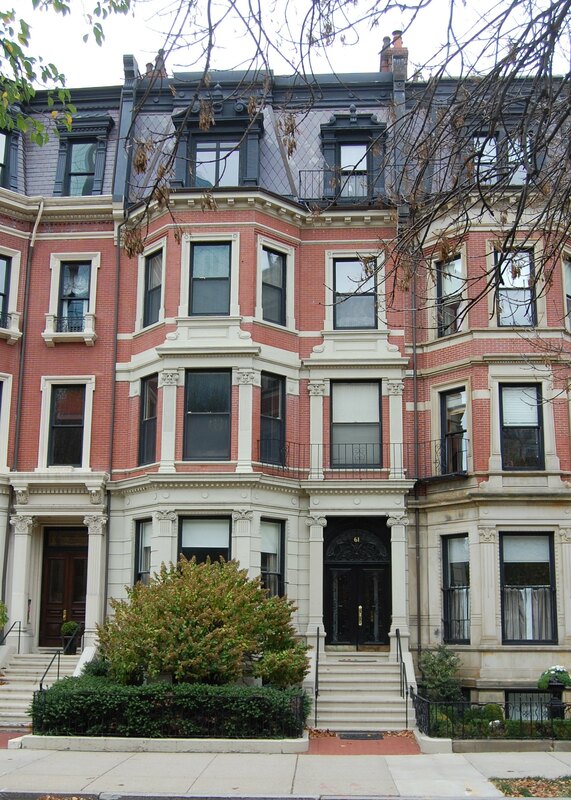 By the 1883-1884 winter season, 61 Commonwealth was the Boston home of merchant John Malcolm Forbes and his wife Sarah Coffin (Jones) Forbes. They also maintained a residence in Milton. They continued to live at 61 Commonwealth in 1885. During the 1885-1886 winter season, 61 Commonwealth was the home of Joseph Burnett, his wife, Josephine (Cutter) Burnett, and their unmarried son, Harry Burnett. They had lived at 164 Marlborough during the previous season. By the 1886-1887 season, the Burnetts had moved 133 Beacon. 61 Commonwealth was not listed in the 1887 Blue Book. By the 1887-1888 winter season, it was the home of wholesale dry goods merchant Joseph Stevens Kendall and his wife, Ellen (King) Kendall. Living with them were their son-in-law and daughter, Richard Fairfax Bolles and Mary (Kendall) Bolles. Richard Bolles was a banker and stockbroker. They all previously had lived in Dorchester. Both couples continued to live at 61 Commonwealth during the 1889-1890 winter season. By the 1890-1891 winter season, the Kendalls had moved to 315 Dartmouth and the Bolleses had moved to Cohasset. On June 5, 1890, 59 Commonwealth was purchased from Sarah Lawrence by George Phineas Upham, a merchant and sales agent for several cotton mills. He and his wife, Sarah (Sprague) Upham, lived at 144 Beacon. By the 1890-1891 winter season, 61 Commonwealth was the home of the Uphams’ son-in-law and daughter, Walter Cabot Baylies and his wife, Charlotte (Upham) Baylies. They previously had lived at 83 Beacon. They also maintained a home in Nahant and a second home, Kippanwoods, in Taunton. George Upham died in November of 1901. 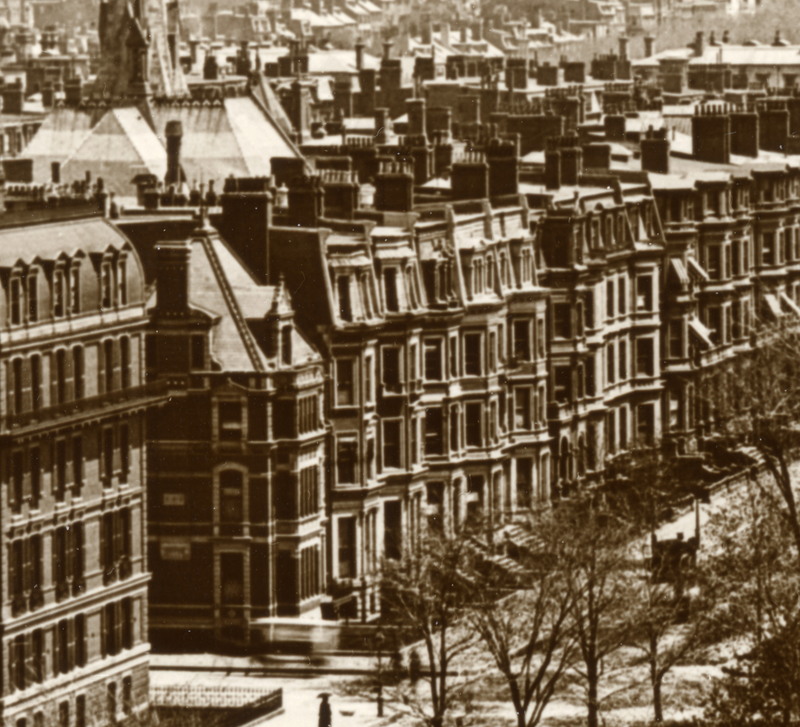 In April of 1903, the estate of George Upham purchased 5 Commonwealth to be the Baylies’s new Boston home. They continued to live at 61 Commonwealth through the 1903-1904 winter season while they had 5 Commonwealth completely rebuilt. 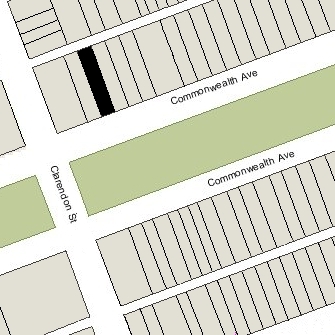 On February 25, 1904, 61 Commonwealth was purchased from the George Upham estate by Amory Appleton Lawrence. His first wife, Emily (Silsbee) Lawrence, had died in April of 1895. He had continued to live at 59 Commonwealth and had remarried in June of 1900 to Gertrude Major Rice. They moved to 61 Commonwealth by the 1904-1905 winter season. His son, Amos Amory Lawrence, an architect and later an antique dealer, moved there with them. The Lawrences also maintained homes in Beverly and Groton. In August of 1905, Gertrude Lawrence’s parents, Francis and Sarah (Austin) Rice, purchased and subsequently moved to 63 Commonwealth. Amos Amory Lawrence continued to live with Amory and Gertrude Lawrence in 1906, but then moved to 17 Exeter. Gertrude Lawrence died in January of 1907. By 1909, Amos Amory Lawrence had resumed living at 61 Commonwealth with his father. In April of 1911, Amory Lawrence married again, to Laura C. (Amory) Dugan, the former wife of Thomas Dugan. Amory Lawrence died in July of 1912, and Amos Amory Lawrence moved at about the same time to Beverly. Laura Lawrence continued to live at 61 Commonwealth, joined by her niece, Laura Caroline Amory, the daughter of her brother, Edward Jonathan Amory of Wilmington, Delaware. By the 1917-1918 winter season, she also had been joined by Edward Amory’s other children: Elizabeth Josephine Amory, Thomas Dwyer Amory, and George Sullivan Amory. Thomas and George Amory were both officers in the US Army. On October 2, 1918, Thomas Amory was killed in action near Verdun. He was awarded the Distinguished Service Cross posthumously and on November 11, 1928, the intersection of Commonwealth and Dartmouth was named Lt. Thomas D. Amory Square in his honor. Laura Lawrence and her nieces and nephew continued to live at 61 Commonwealth during the 1920-1921 winter season. They moved soon thereafter to 207 Commonwealth. 61 Commonwealth was not listed in the 1922 Blue Book. On May 1, 1922, 61 Commonwealth was purchased from the estate of Amory Appleton Lawrence by Horace Binney, He and his wife, Marie Anne (Sorchan) Binney, made it their home. They previously had lived at 163 Commonwealth. They also maintained a home in Newport, where he was a prominent yachtsman. Horace Binney died in January of 1937. Marie Binney continued to live at 61 Commonwealth until her death in July of 1955. On October 15, 1955, 61 Commonwealth was acquired from the estate of Horace Binney by Margaret Monahan. On February 15, 1956, 61 Commonwealth was acquired from Margaret Monahan by John D’Alessandro (D’Allessandro) and his wife, Lucy D’Alessandro. They previously had lived at 848 Beacon. In August of 1956, they applied for (and subsequently received) permission to convert the house from a single-family dwelling into a two-family dwelling and doctors’ offices. They amended their plans in September of 1957 and converted the house into seven apartments. On February 15, 1963, 61 Commonwealth was acquired from the D’Alessandros by Nathan R. Miller, an accountant. Sometime between 1957 and 1972, one of the seven apartments was subdivided into an eighth apartment without a change in occupancy having been obtained (the eighth unit was legalized by the Board of Appeal in March of 1992). 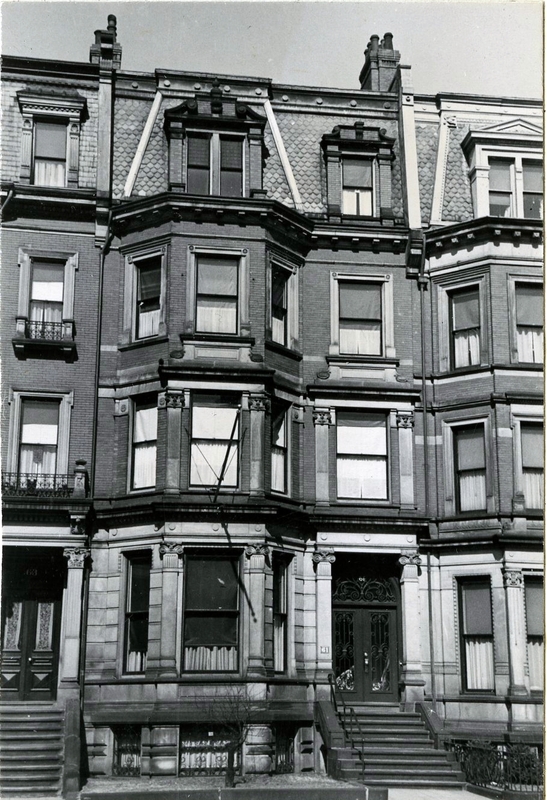 On July 6, 1973, Nathan Miller converted 61 Commonwealth into eight condominium units, the 61 Commonwealth Avenue Condominium.